God called, "Adam, where are you?" Adam answered, "I hid myself because I was afraid." God asked, "Have you eaten of the fruit I commanded you not to eat?" 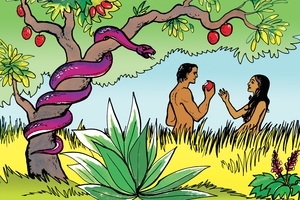 Adam replied, "The woman you gave me gave the fruit to me and I ate it." To Adam God said, "Because you disobeyed Me, the ground will not produce abundantly for you. It will produce thorns and thistles. You will work hard and earn your living by the sweat of your brow. Later you will die and return to the ground from which I made you." My friends, we are like Adam and Eve. We disobey God's Word also. We do many other bad things that displease God. We, too, deserve to be punished. But God loves us. That is why God sent Jesus to live in the world: to make a way for us to come back to God again. Jesus received our punishment. He died but came back to life. Because He took the punishment we deserved, we do not have to suffer. If we trust Jesus, God will receive us. You can talk to God. Thank Him for sending Jesus to help us. Trust Him and obey Him. GRN has recorded a version of this script in 408 languages and dialects. See full list.